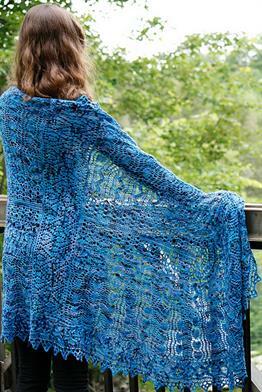 This generously sized, blanket like lace shawl uses numerous motifs for an impressive finished garment! This pattern is from Koigu Magazine Issue 7, design by Lynette Meek. Size US 7-47" (two are needed), and 3-24" needles (or size needed to obtain gauge), stitch markers, and a tapestry needle are required but not included. Finished Measurements: 84x40" after blocking. Gauge: 26 stitches and 32 rows = 4 inches in Eyelet and Bead Stitch. Addi Turbo Circular - US 3 - 24"
$110.95 -- Kit price including yarn and pattern book. If you like the Koigu KPPPM Tapestry II Shawl kit, then you may be interested in some other kits covered in our Spring, Fall, Winter, and Shawls collections.